"Your last lesson Scotty: when you start killing you can't stop it." 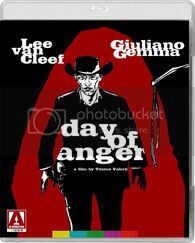 Recently released from Arrow Films is Day of Anger, a little known western (to me at least) by Sergio Leone protege Tonino Valerii. After the success of Leone's Dollars trilogy, Lee Van Cleef did countless Spaghetti Westerns (of various quality) so my expectations were fairly low for this film. The addition of Italian star Giuliano Gemma peaked my interest enough to check this one out. Giuliano Gemma stars as Scotty, a shy outcast who was orphaned as a child and given the lucky job of emptying the town's toilets. A drifter named Talby (Van Cleef) comes into town with thoughts of settling (and maybe even taking over). Scotty tries to follow Talby after he encourages Scotty to stick up for himself. Reluctantly Talby accepts Scotty as a sidekick but things start to change when Scotty's marksmanship and fearlessness start to threaten Talby's plans.